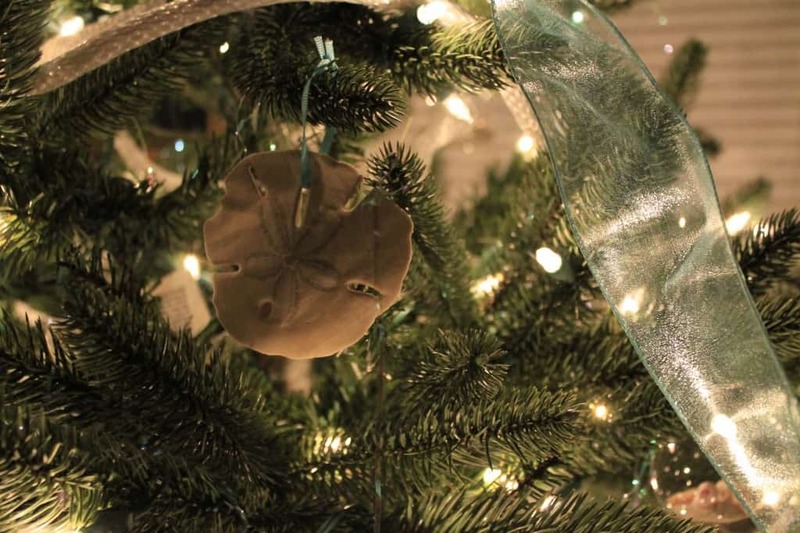 If you like this tree, check out our 2015 Coastal Christmas tree, too! 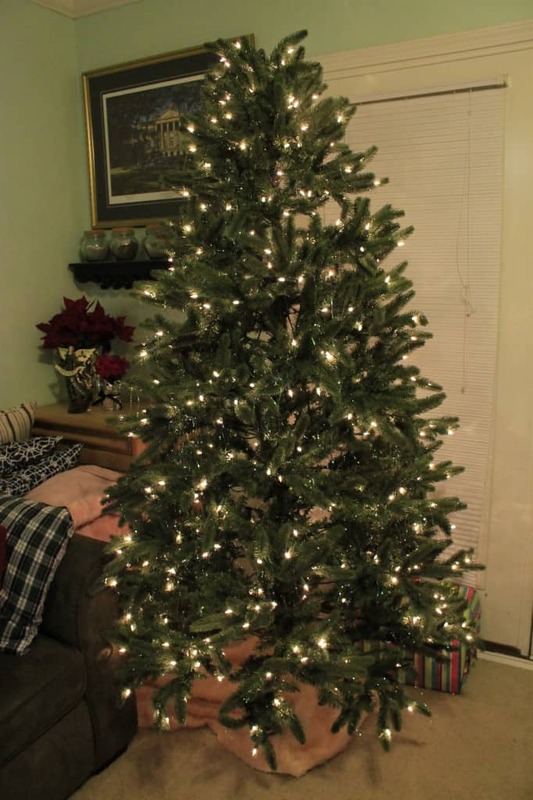 One of the most iconic parts of Christmas has to be putting up the tree. 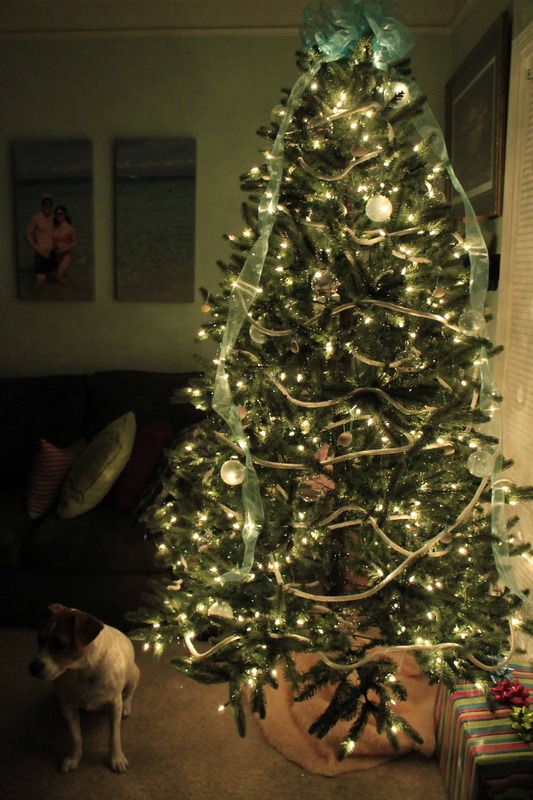 Apparently I’m weird (or maybe everyone else is weird) in that I love a themed tree. Red and White (“Christmas”) is a fine theme, but I tend to steer towards something a bit more jazzy. Sean was raised with a Classic Christmas tree with the same ornaments every year and a very nice Christmas vibe all around. That is great. I can totally see the appeal to that, especially if you have kids or collect ornaments. But I have way too much ADD to do it the same every year! Love coastal decor? 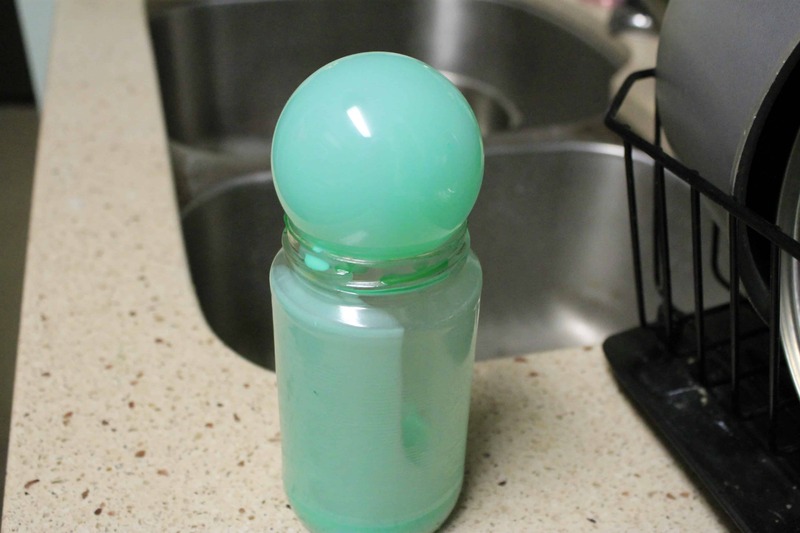 Be sure to check out our DIY Coastal Kitchen Makeover! For the last two years, I’ve had a citrus themed tree. 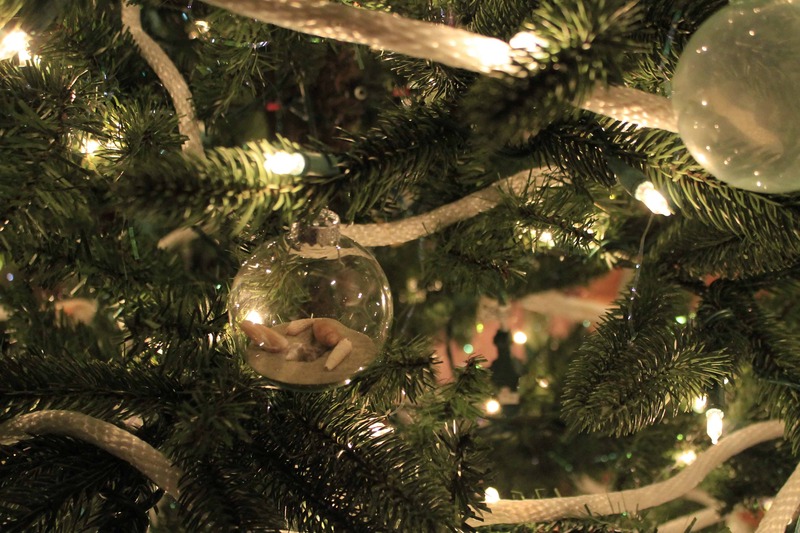 It featured felt citrus ornaments, hand painted balls, and bows. It was great, but I was ready for a new theme this year. Keeping with the vibe I’ve been feeling, I decided to have a Coastal Christmas theme. I love the beach and seaside colors and thought that it would make a beautiful tree. 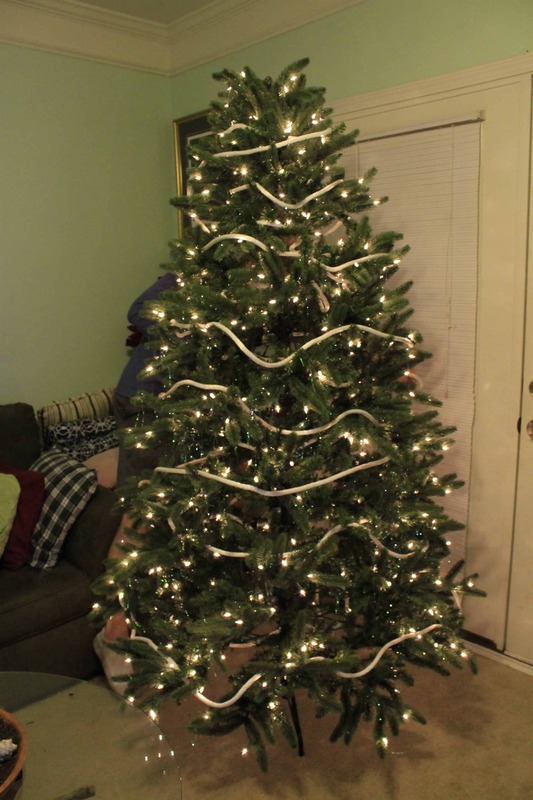 We started with our 6’ faux tree that I got at a thrift shop 2 years ago for $20. It’s pre-lit and convenient. One day, when I have a house, I’ll upgrade to the real thing. But for now, this will have to do. For garland, we used a 100 foot long roll of white nylon rope. I purchased it at Lowes for a craft that has now been bumped to January. We made sure not to cut the rope so I can still use it again. 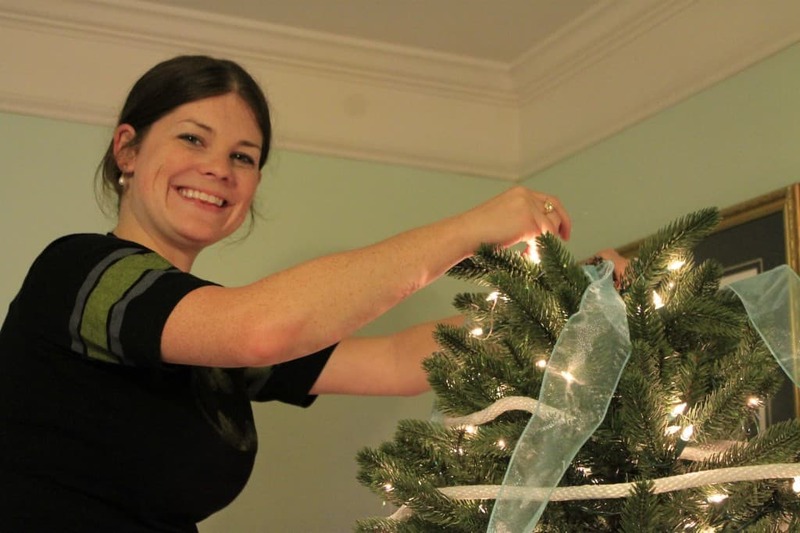 For the hanging of garland, I like to wrap it around each horizontal layer of the tree (about every foot) twice: once deep inside and once on the outside. I think this adds depth to the tree. 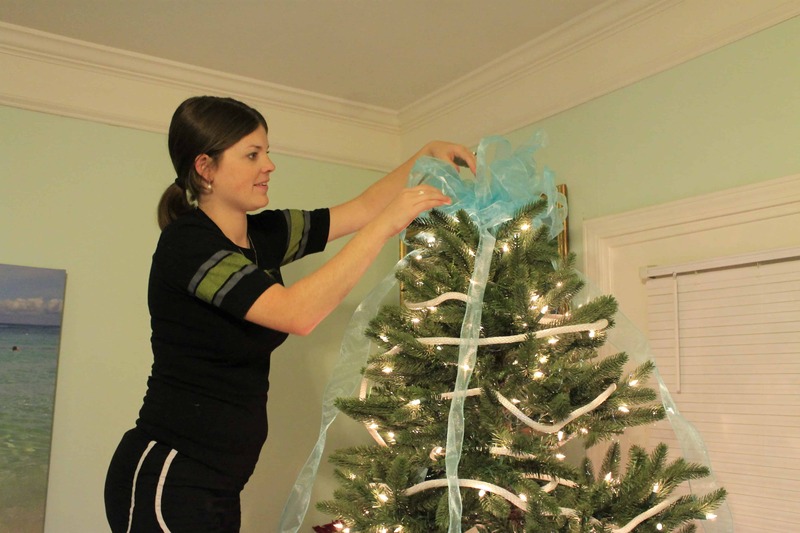 Next came the topper. 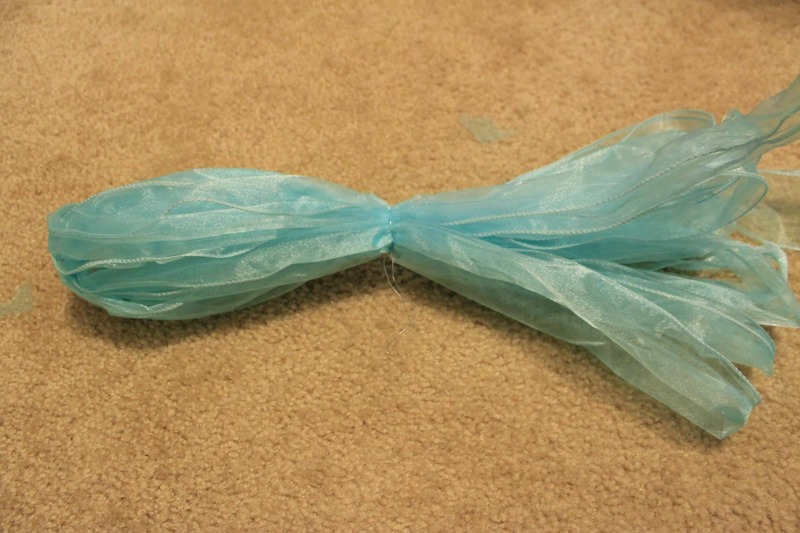 I used wire ribbon to make a big blue bow. It took about ten tries but I got something acceptable to go up there. I also made 4 lengths of ribbon as tall as the tree and attached them (with floral wire) under the bow. 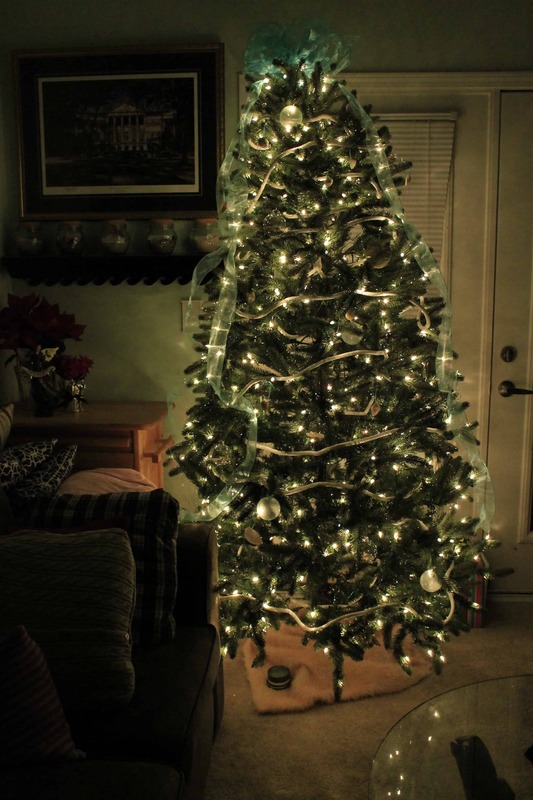 I love having ribbon spinning down the sides, I think it makes the tree look like a big present! Next came the ball ornaments. 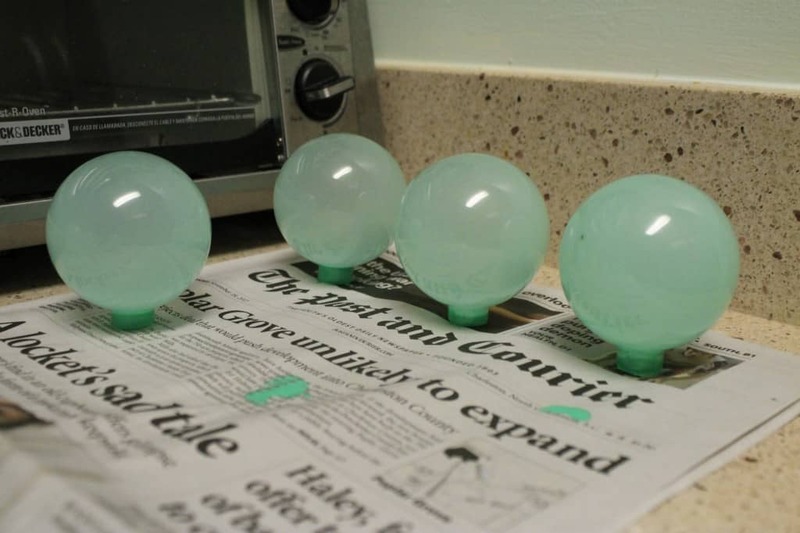 We got 4 packs of 6 fillable clear balls from Michaels. Warning: they hide these. We could only find the individual ornaments ($1 each and crappy plastic!) Finally Sean found these out front. They might be glass (at least they feel like it) and came in a 6 pack for about $3. Also, use a coupon and you’re good to go. We split the ornaments in half and each got decorating. 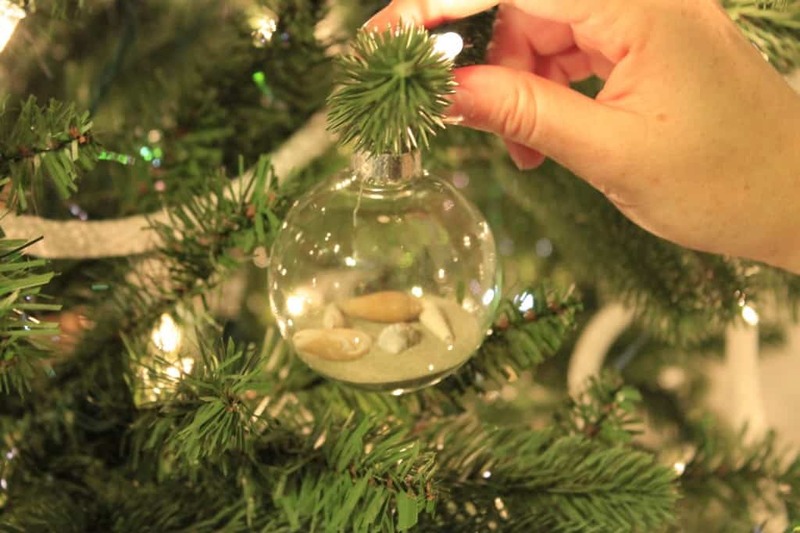 Find the full tutorial on how to make sea glass ball ornaments here! 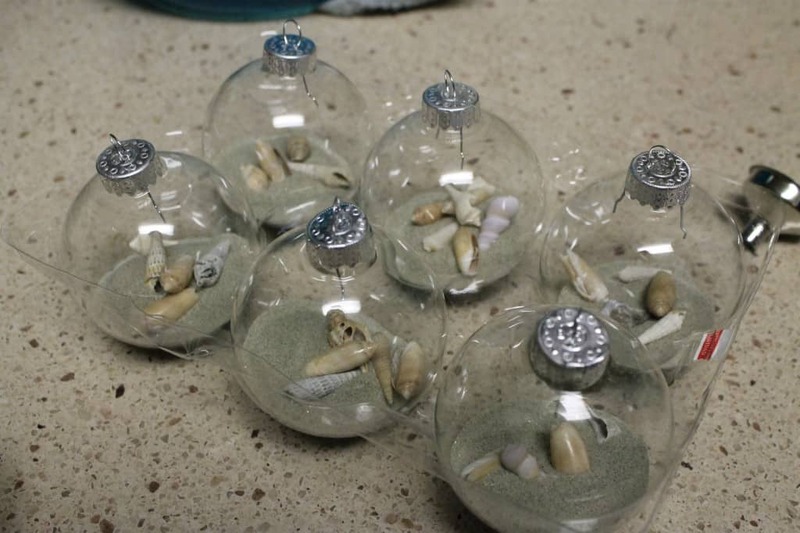 I decided to make my 12 into balls of sea glass. 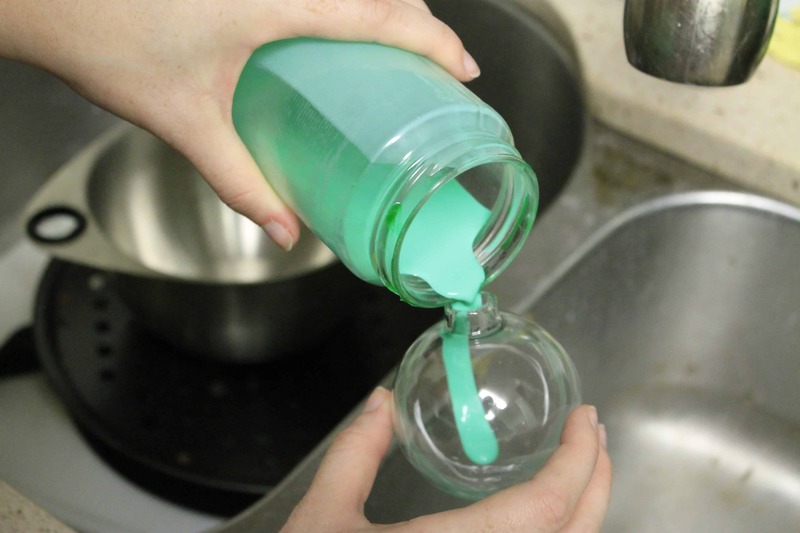 In an old jar I mixes 1 part warm water, 1 part white glue. Shake it up. Then, add food coloring. I did 3 drops green 1 drop blue. Shake again. 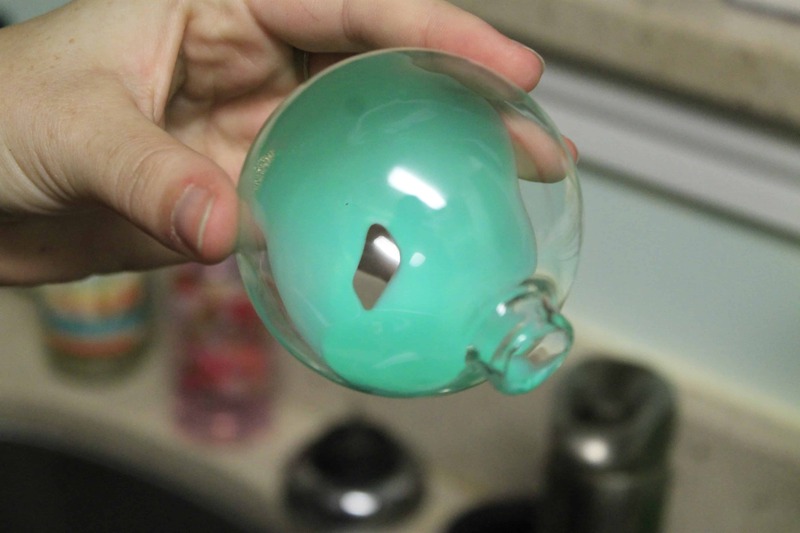 Now, dump some “paint” inside each ornament and swirl it around. Flip them upside down to drip dry. I did 2 coats to get my desired coloring. Paint would have been darker but I wanted an opaque glassy look! Sean got really creative with his 12 ornaments. 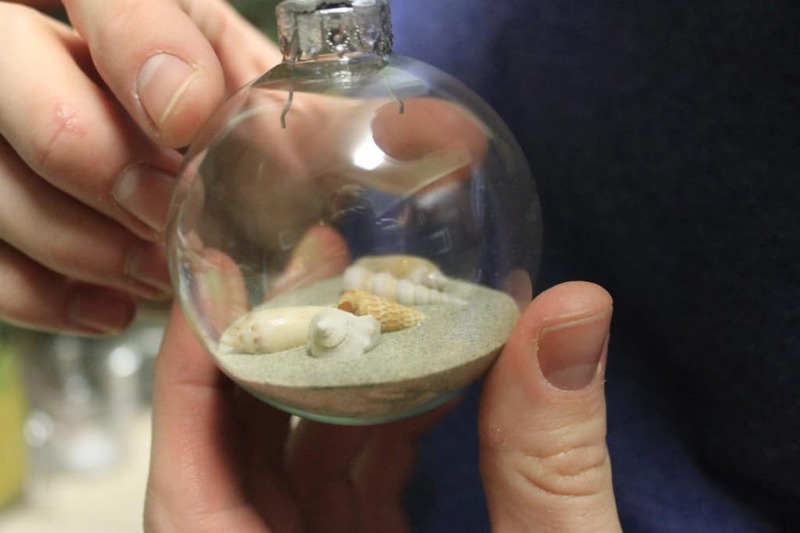 He added about an inch of Folly Beach sand to each, along with 4 or 5 small sea shells. He wins this battle because I think they turned out gorgeous! 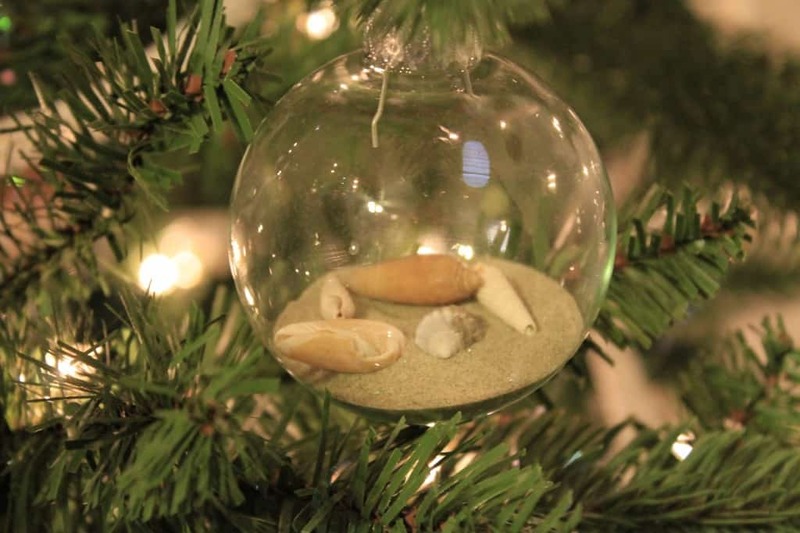 Click here for a full tutorial on these DIY Beach Ball Ornaments! 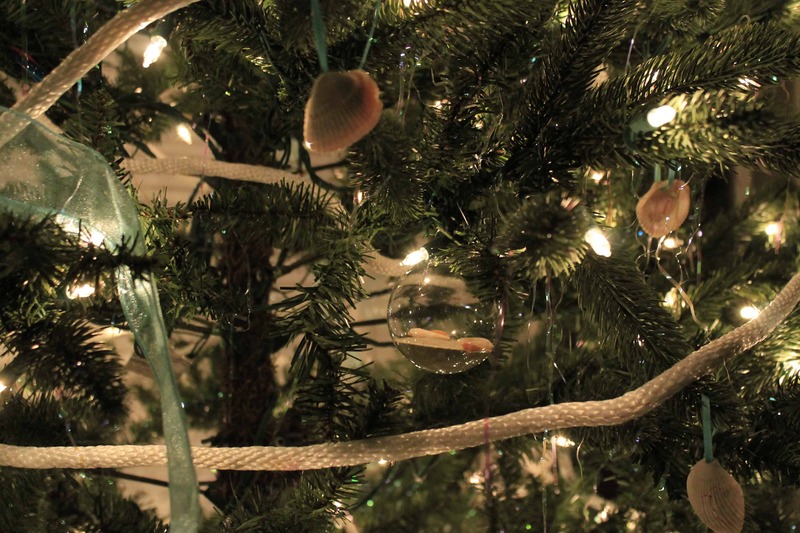 We also strung some white shells on blue ribbons and hung them from the tree. Sean drilled holes in the ones that didn’t have holes. 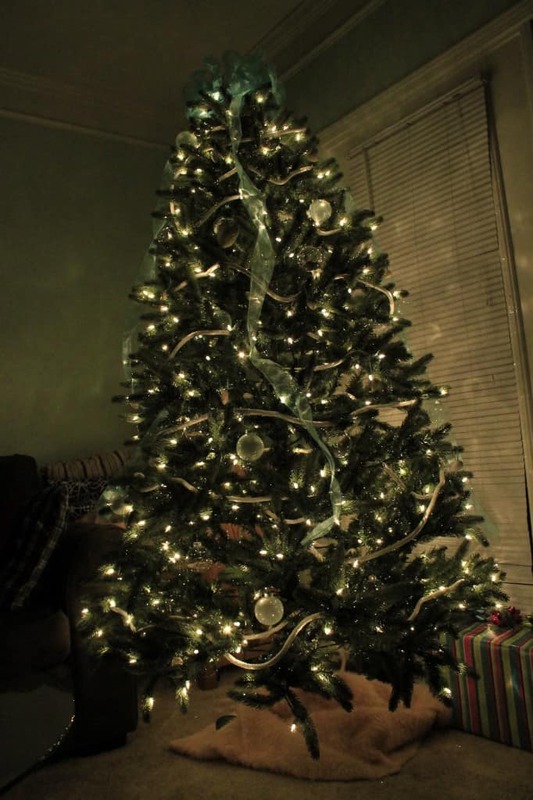 I LOVE how the tree turned out. Not too fussy, but definitely very Charleston and very us! 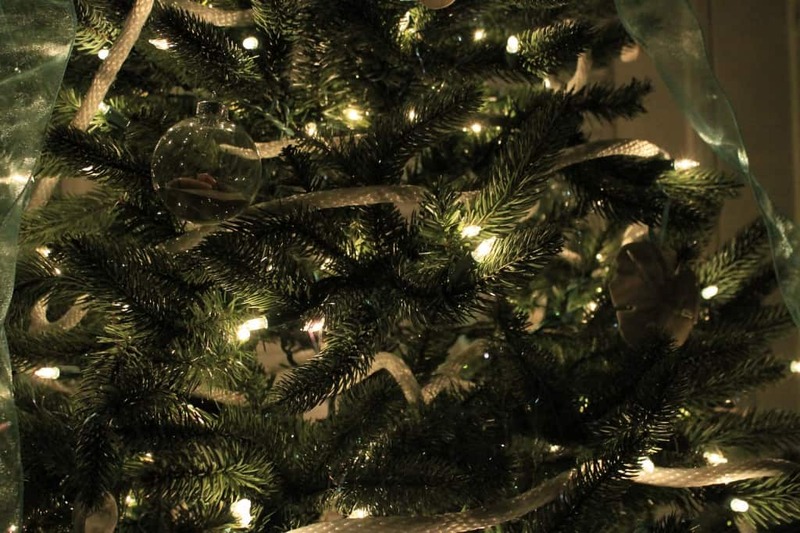 Do you theme your tree? Share it below!